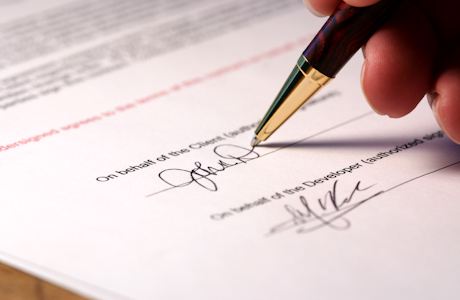 Signing business contracts online is s relatively new phenomenon. It can be effective and successful, but there are five proven tips that must be learned to assure that such digital signatures are fully legal and binding. Well before ever signing a contract online, it’s essential to read through it entirely at least twice to become most familiar with it. It’s important to try to understand every single clause and paragraph, including all of the possible loopholes and exclusions that may be written into it. If a person doesn’t feel he has the contractual expertise to fully comprehend the contract, then he should definitely secure the professional services of either a certified public accountant, an attorney, or a certified financial planner who is familiar with the type of contract in hand. Putting one’s digital signature on a contract without reading it is business and financial suicide. It simply must not ever be done if an individual wants to be fully and completely protected from all the possible implications and consequences that can occur from not having completely evaluated and analyzed each particular contract. In addition to fully reading through it, before signing a contract online, it’s imperative to telephone the other party and fully go over all of the pertinent details, including all the major and minor points and clauses. Discuss all the paragraphs and subsections in their entirety and ask any questions that are not immediately understood so both parties are completely clear as to the specific potential implications of each provision. Don’t ever rush through this process. It’s essential be be alert and fully composed as well. Don’t get emotional over any provisions or issues. A contractual party simply should adjust his mindset to becoming alert to any special provision that may in the long term put him at a financial disadvantage with the other party. Each party has to compromise a little during their telephone conversation before the final signing of the contract is eventually carried out. In certain countries and provinces, digital signing of contracts is legally prohibited, so this must be found out in advance of ever signing the contract. No matter how superb the contract seems for the respective parties, if it can’t legally be signed over the Internet, then it can never be a valid and fully binding contract in that particular country. And if this is the country where the bulk of the business is going to take place, then it’s just a complete waste of time to attempt to sign it if the laws state it’s unacceptable. So perform extensive, legal due diligence about this matter well in advance of ever getting to the point of signing the contract. Not every standard computer software package has the requirements to make digital signatures on online documents. It’s essential to research just which software packages are out there that can most effectively and most affordably imprint the required e-signings on the contractual documents under review. Some manufacturers of this type of software program charge a premium while others are more competitively priced, so it pays to do extensive research online to attempt to secure the very best price possible for the quality program that’s required. Before any digital signatures are paid, it’s essential that one of the most important aspects of the contract be fully negotiated in advance. This includes the important matter of just how financial remuneration is going to be paid. Will it be in a lump sum up front or will it be spread out over time? This is all dependent on the individual requirements of the contractual parties involved, but if this issue isn’t ironed out in the first place at the outset, then there’s really no point going on in the contract execution proceedings. Whether payment is agreed to be made in advance or via financing is not the entire issue when it comes to signing the digital contract. What matters even more and what is at a greater stake is the fact that the party has the capacity and credibility to make the payment in the first place. Anybody over legal age can enter into a contract even if they don’t have two nickels to rub together. So it has to be made certain that the signing party has adequate financial resources to indeed transact the deal before a digital signature is ever performed on the contract. This requires some extensive research as well into the financial strength of the particular party. Keeping up with the latest blogging news, John also deals with cheap office stationery and computer desks as part of his job with a small company in Manchester.